Justice Minister explains why there is no reason for the continued existence of the government without Bennett as defense minister. 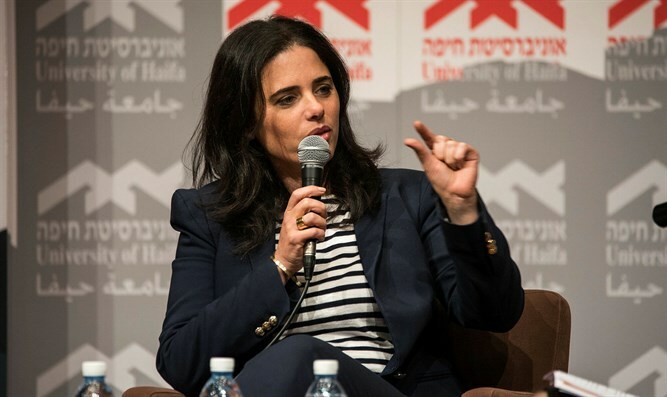 Justice Minister Ayelet Shaked on Sunday referred to her party's demand to place the defense portfolio in the hands of Minister Naftali Bennett as a condition for the continued existence of the government. On the other hand, she continued, "What still needs to be done (the Override Clause, the removal of infiltrators, the evacuation of Khan al-Ahmar, bringing back deterrence, the prevention of terrorist funds) - it is already clear that it will not be done under this government." "The only justification for the continued existence of the government until November 2019 is that Bennett will revolutionize security, restore Israel's deterrence that was lost under Liberman over the past two years, and help to break free of the deep crisis in trust in security. Without this, this government is called ‘right-wing’ but in practice fulfills left-wing policy,” Shaked said.